Today, gemmologists have to be able to identify gemstones as well as to detect an ever-growing list of gem treatments and synthetics. 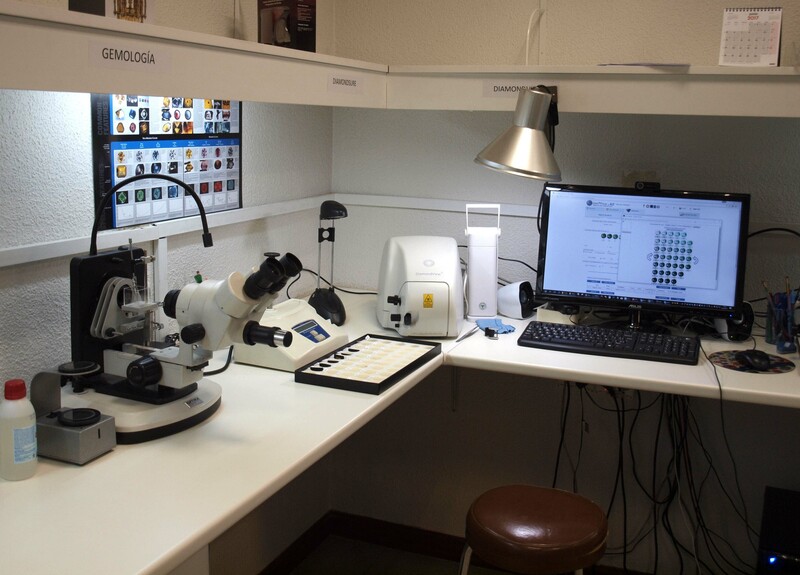 The main objective of the FEEG examinations is to graduate gemmologists from the member institutes with the highest level of knowledge and expertise in both practical and theory. FEEG gemmologists need to master the gem properties and have to achieve the “Academic Excellence” in the noble art of gemmology. Gemmology. Descriptions of gemstones, minerals and rocks. Definition of a gem. Natural gems (minerals, rocks, non-minerals, organic materials). Artificial stones (imitations, composites and synthetics). Matter constituents (atoms, molecules, ions, etc.). Chemical composition of the minerals. Hardness and durability. Mohs’ scale. Cleavage. Parting. Fracture. Specific gravity and its determination (hydrostatic and heavy liquids). Other properties (thermal, electrical, etc.). Nature of light. Visible spectrum. Reflection and refraction (laws). Single and double refraction. Optic properties of gemstones. Refractive index. Total internal reflection. Dispersion. Refractometer (principles and use). RI determination on isotropic and anisotropic stones. 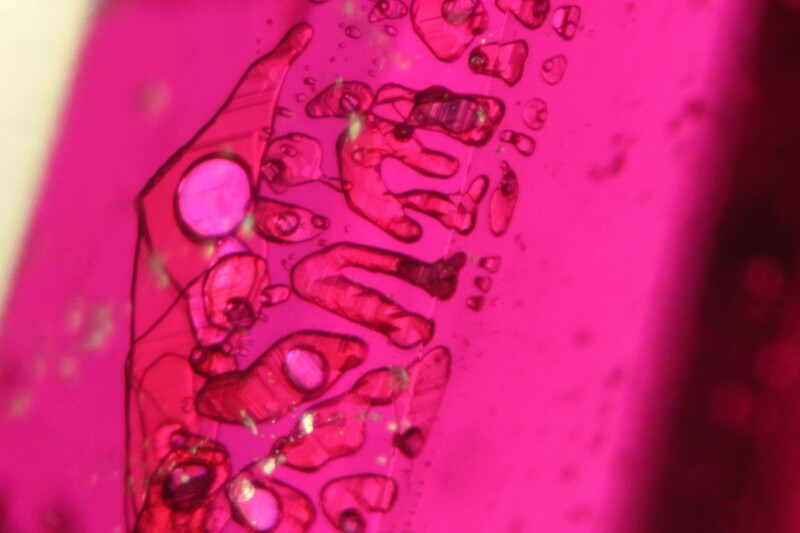 Birefringence determination. Optic sign determination. Polarized light. Polariscope, principles and use. Absorption of light. Absorption spectrum. Spectroscope, principles and use. Main types of absorption spectra. Ultraviolet light, infrared, X-rays. Lamps. Luminescence. Fluorescence and phosphorescence. Light interferences. Sheen and luster. Causes of colour in gemstones. Pleochroism. Dichroscope, principles and use. Colour filters. Special optical effects. Loupe 10x, binocular loupes, microscopes, balances, Leveridge gauge, etc. Different types and shapes of cut. Their physical, morphological and genetic classification. 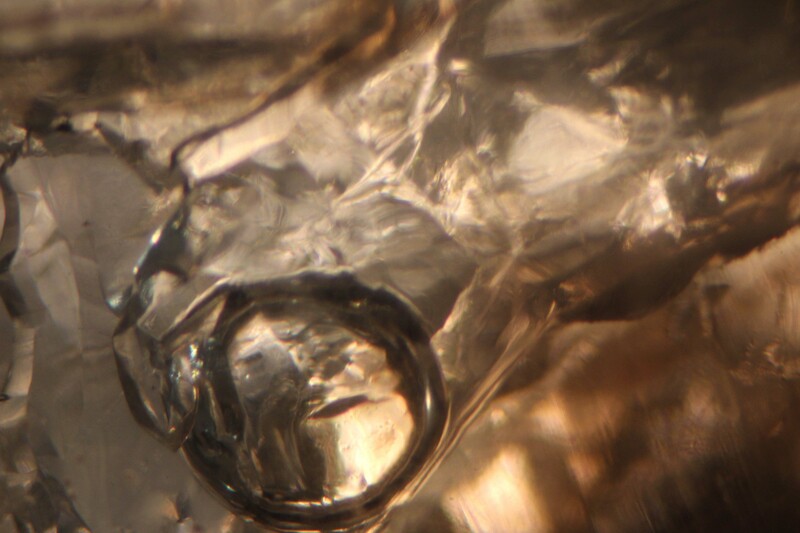 Inclusions in the most important gemstones. Three-phase inclusion in an emerald from Muzo, Colombia. 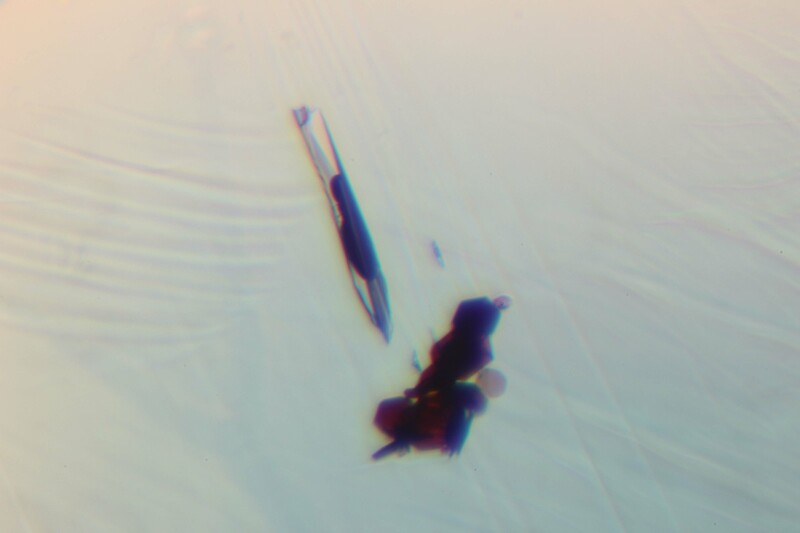 Photomicrograph by Ivo Quintens. Negative crystals in a quartz from Brandberg, Namibia. 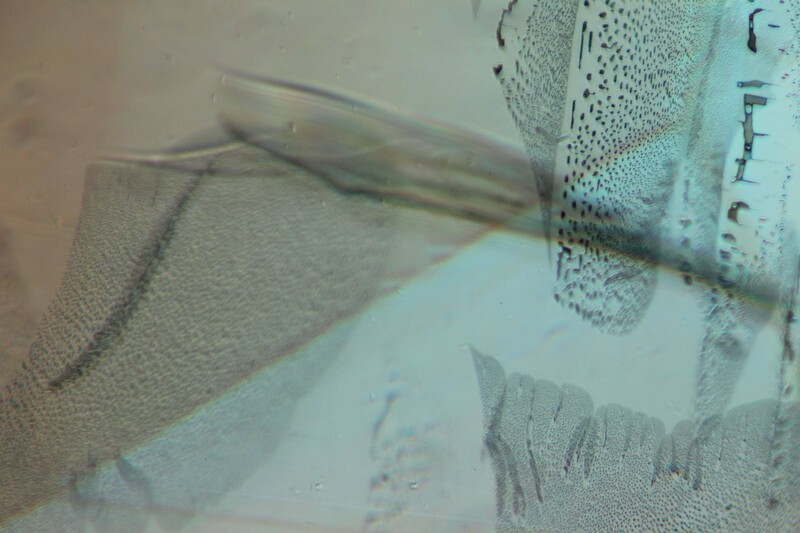 Photomicrograph by Guy Lalous. 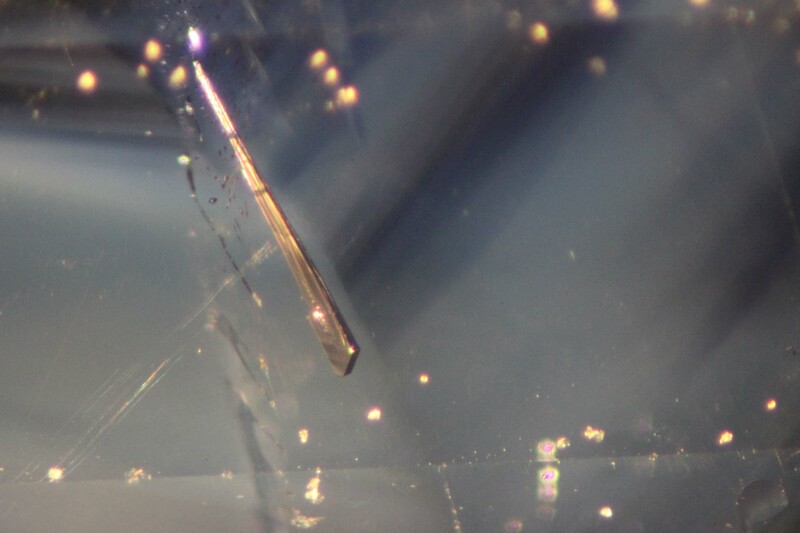 Two-phase inclusion in a quartz from Brandberg, Namibia. Photomicrograph by Guy Lalous. 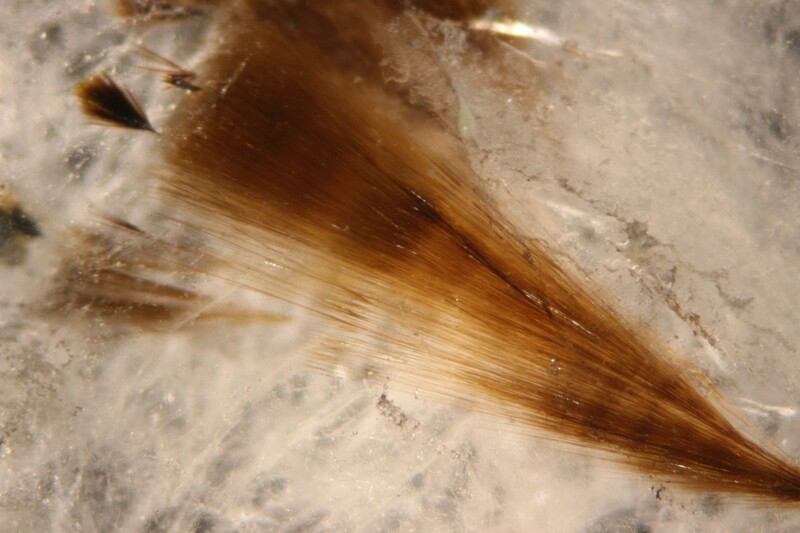 Goethite inclusion in a quartz from Rio Grande do Sul, Brazil. Photomicrograph by Guy Lalous. Heat. Heat diffusion. Dyeing. Coating (including paintings and foils). Impregnation. Filling. Radiation. Laser. HPHT. Treatments in the most important gemstones. Care of gemstones. Melt, flux and hydrothermal methods and varieties. Synthetic stones and imitations produced by those methods. Characteristic inclusiaons of each method. 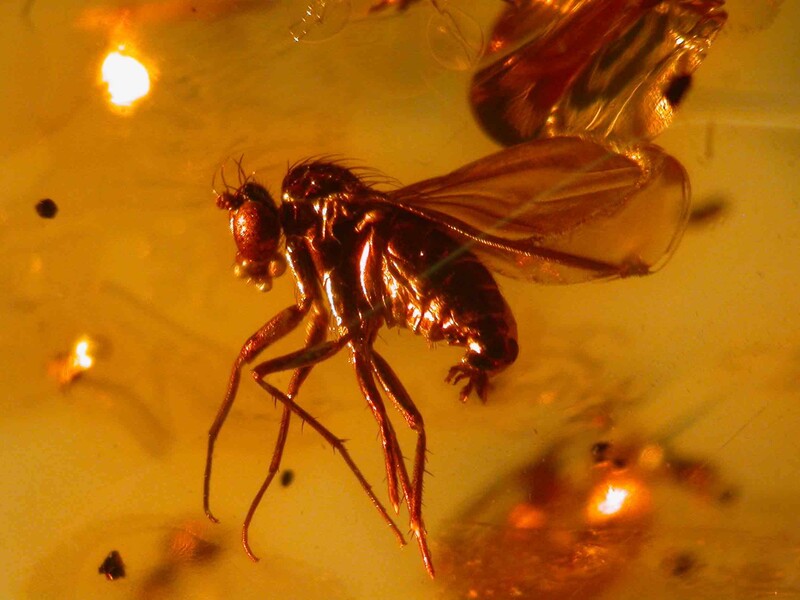 Baltic amber with an insect. Fotomicrograph by Julia Griffith. Glass: Composition and varieties. Usual glass imitations. Identification. Plastics: Usual plastic imitations. Identification. Composite stones: Doublets and triplets. Usual assembled stones. Identification. Modern imitations: Opal, jade, coral, turquoise, lapis lazuli, chrysoberyl, etc. Identification. Diamond imitations: YAG, GGG, cubic zirconia, strontium titanate, synthetic rutile, synthetic moissanite etc. Identification. Properties, inclusions and identification of flux and hydrothermal emeralds. 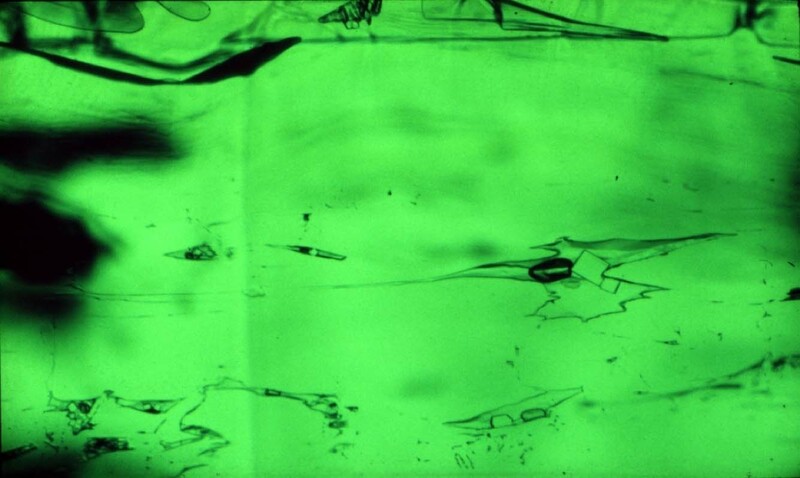 Two-phase primary flux-filled cavities in a flux emerald from Russia. 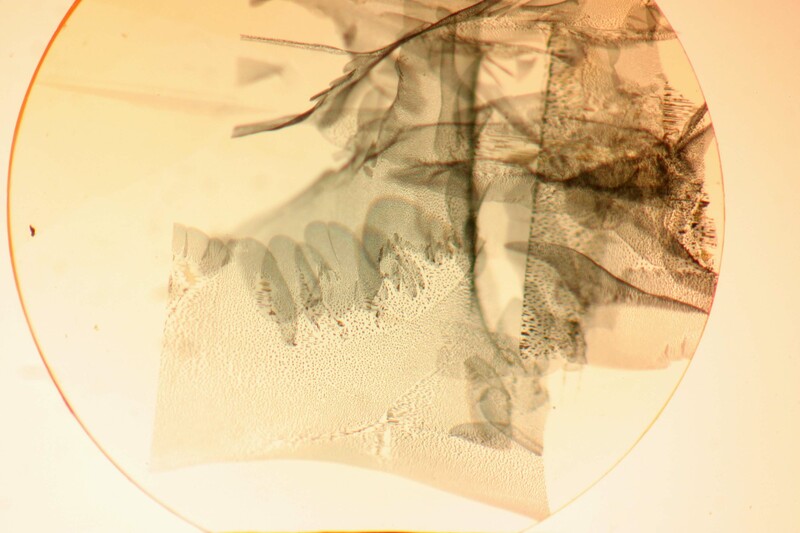 Photomicrograph by Guy Lalous. Flux veils in a Chatham flux emerald. Photomicrograph by Guy Lalous. 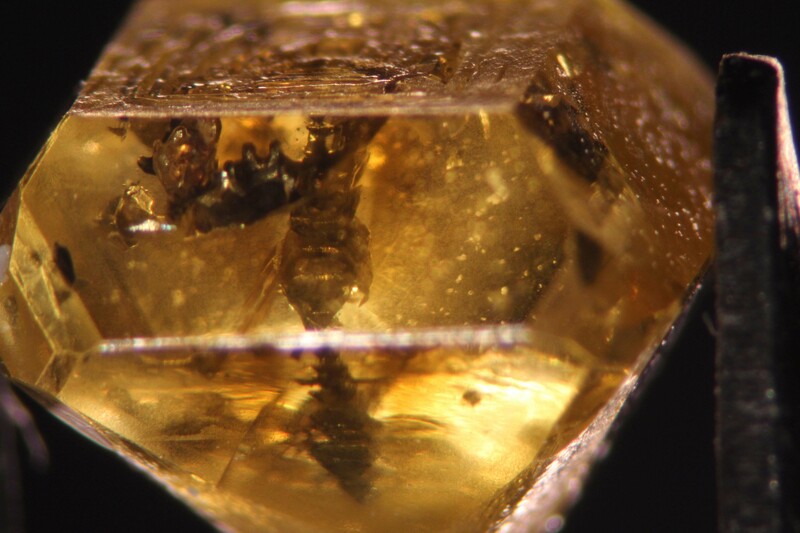 Nailhead - Three-phase inclusion (liquid-gas-solid (phenakite)) in an Empress synthetic hydrothermal emerald. Photomicrograph by Guy Lalous. Inclusions and identification of melt, flux and hydrothermal and flux rubies and sapphires. 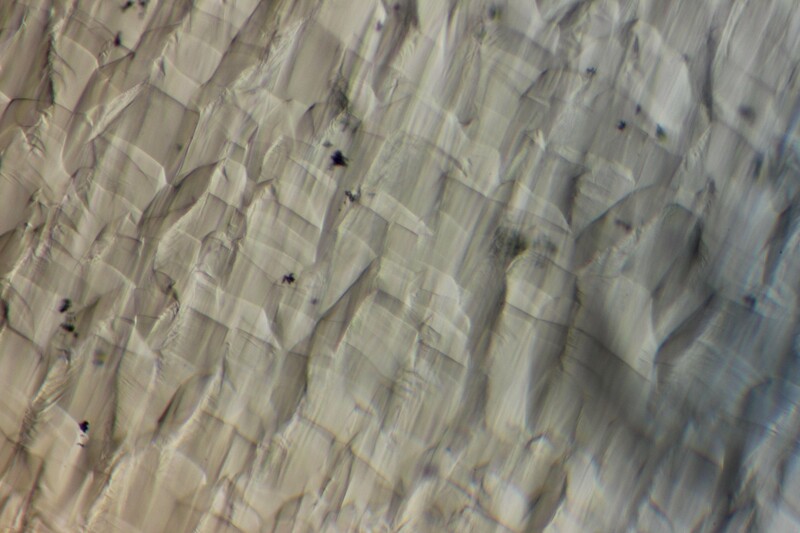 Platinum inclusion in a Chatham synthetic flux sapphire. Photomicrograph by Guy Lalous. Two-phase primary flux-filled cavities in a Douros synthetic flux ruby. Photomicrograph by Guy Lalous. 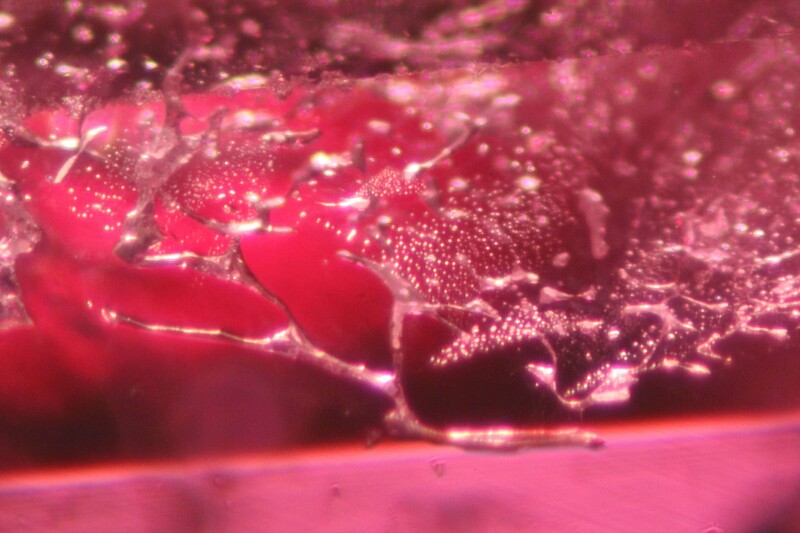 Flux Remnants in a Kashan synthetic flux ruby. Photomicrograph by Guy Lalous. Properties of HPHT and CVD synthetic diamonds. 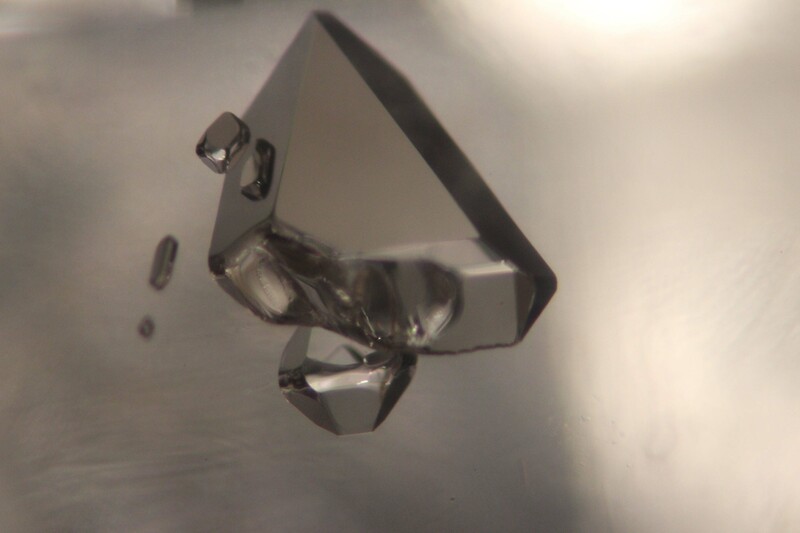 Metal Flux and cube-octahedron growth in a synthetic HPHT New Age Diamond. Photo by Guy Lalous. 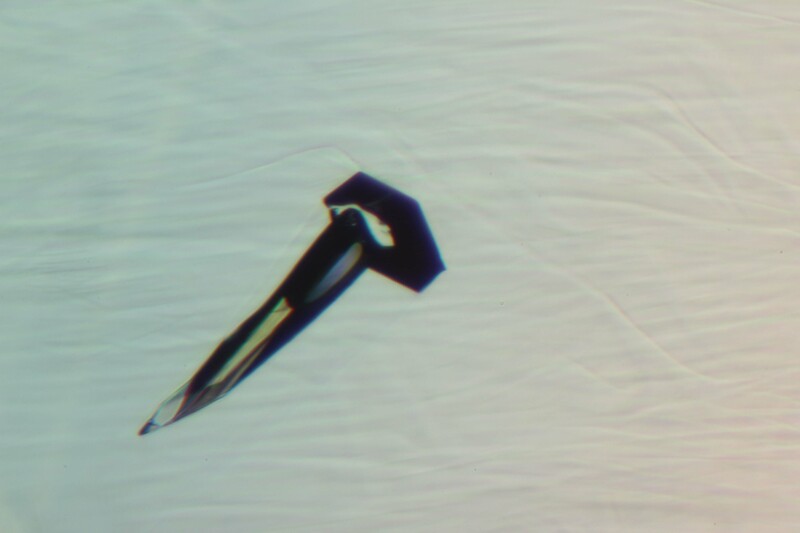 Cross shape in a HPHT synthetic diamond due to the in cube-octahedron growth. 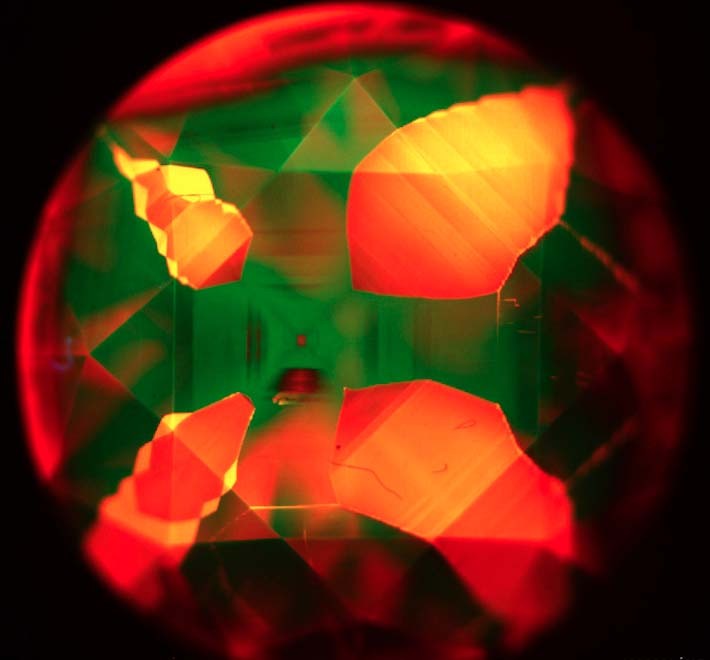 The orange-red growth sectors (emission of 637 nm, center NV-) correspond to the cube faces, while the central green cross (emission 496 and 503 nm, centers H4 and H3), is formed by the octahedron sectors. Photo by Egor Gavrilenko. synthetic beryls (i.e. aquamarine, blue and red beryls). 22. Gemmological Nomenclature. Incorrect Denominations. CIBJO Rules. Chevron type of growth in a Malossi synthetic hydrothermal aquamarine. Photomicrograph by Guy Lalous. Read our syllabus and feel you're up for the challenge? You can apply for the FEEG examination directly by filling in our application form and sending it back to us.